Viper's Bugloss can dominate landscapes where it occurs in large numbers, turning hills and slopes in sand dunes and other favoured locations to a deep vibrant blue. Viper's Bugloss lives up to its common name in many ways: as the flower stem develops it does so in a coiled form, the red stamens of the flowers stick out like an snake's tongue, the stems, which are red-flecked, resemble snake's skin and even the fruits are shaped like adders' heads. The flowers of Viper's Bugloss (and several other bugloss species to be found throughout Europe) change colours between pink and purple as can be seen on our native plant. Other species of flowers in the Borage family do this, too, including the lovely Blue Hound's Tongue, Cynoglossum creticum. From time to time white spikes of Viper's Bugloss occur in the UK; they are widespread but not common. 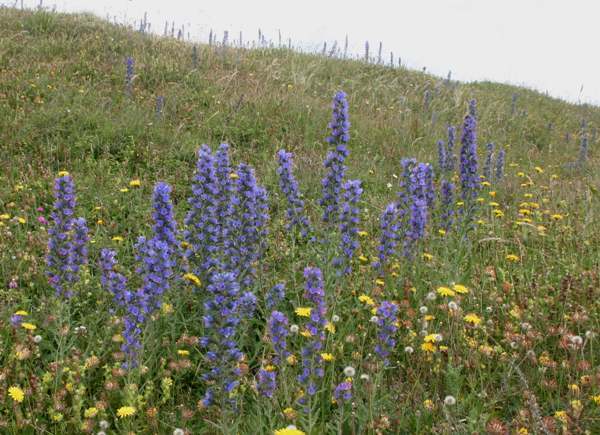 This medium-height biennial is a member of the Borage family and is commonly found on sand dunes, well-drained slopes and in places where construction work has left the soil bare. Anywhere near the coast is a good place to look for this wildflower. 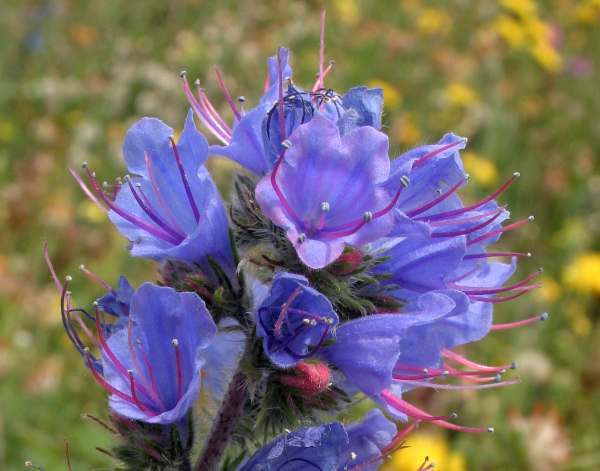 Viper's Bugloss can be seen in flower in Britain and Ireland during June, JUly and August. Further south in Europe this widflower comes into bloom much earlier. In the Mediterranean the flowers of Narrow-leaved Bugloss (Echium angustifolium) are predominantly pink when fully open. In other European countries, including the island of Crete in Greece, there is a very pale-flowered species (Echium italicum) which is a creamy-pink colour. 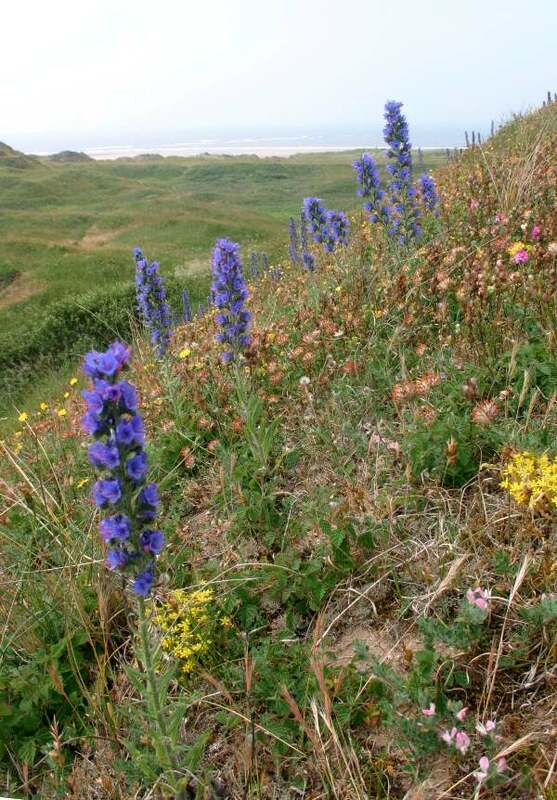 These species share the same habitat preferences as our native Viper's Bugloss, and are flowers of the coast appearing in sand dune systems and along the edge of tracks and roads. Further inland they grow anywhere that is well drained - on roadside verges, in waste land and other places where land is disturbed and the soil is exposed. Viper's Bugloss is one of our most beautiful wildflowers and is, thankfully, still common throughout Britain and Ireland as well as in many parts of mainland Europe. This plant is one of Europe's most successful exports! It has found its way as far as Australia and America, where they do not share our enthusiasm for this stunning flower and regard it as an invasive alien species. Common names for the plant include Paterson's Curse in Australia and Blue Devil in America - amongst many others, no doubt. We found these splendid specimens of Viper's Bugloss in Kenfig National Nature Reserve in South Wales.